How does an independent natural food store in New York City stand out among a sea of corner markets, fast casual restaurants and mass retailers? This store general manager tells us. When it comes to grabbing groceries or a quick bite, New Yorkers have more options than people pretty much anywhere. So for an independent natural products store to stand out from the countless corner markets, natural food chains, quick-service restaurants and big-box stores, it must offer shoppers something pretty special. After 23 years of bustling business, it’s clear that LifeThyme All-Natural Market does just that. When the store opened in 1995, natural wasn’t hip, organic was still newish, and healthy? Well, for much of America, that meant margarine, bagels and Snackwell’s. But LifeThyme’s founders felt New Yorkers deserved better—and they delivered, with an oasis of fresh organic produce, a full range of nutritious natural groceries and even a vegan bakery. The reputation the store built for quality, service and unique product offerings in those early days has lasted through today. NFM spoke with General Manager Jason Bander about how LifeThyme stays on the cutting edge and outshines its ever-increasing competition. What was your path to LifeThyme? Jason Bander: LifeThyme was started by my father and two partners, so I am in line to become a second-generation owner. My background is actually in trading and asset management, but LifeThyme was built across the street from where I lived, so assisting with the construction and grand opening was a convenient side project at the time. Years later, when the store and its ownership were going through a major transition, I was approached to help out. Why do customers choose LifeThyme over the countless other places they could shop? 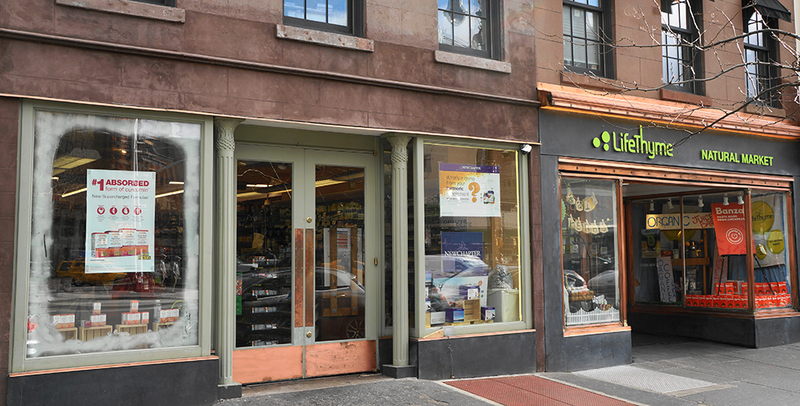 JB: The store is in a great location in Manhattan’s West Village, but mainly, our reputation is what draws in customers. LifeThyme is a known pioneer and product incubator. Our selection of quality, locally produced groceries, dairy and produce is unmatched. All of our produce is organic and relatively exclusive to us. We have curated strong relationships with farms so that we can truly say to customers, we are “bringing the farmers market to you.” And no one makes better vegan, gluten-free baked goods than us, let alone the full selection of goods we produce for special dietary needs. Our kitchen and vegan bakery are more influential than we can estimate. We’ve seen so many derivative businesses come and go over the years, and we know they were influenced by us. Your bakery has always been vegan? JB: Yes, 100 percent, by the fortune of hiring a baker in the early days who said, “I only bake vegan.” Done. This has survived as it has been handed down through several teams of bakers. Our bakery also uses only unrefined flours and sugars, is mostly organic and is still uniquely exceptional. I mean, does any bakery counter-cut cake anymore? We still do. We have considered easing the standards to include non-vegan ingredients such as honey and whey protein, but we haven’t made any decisions yet. It’s important to keep our finger on the pulse. JB: Today is far different than 1995. Now we sit quite uncomfortably at the epicenter of (soon-to-be) three Trader Joe’s within a half-mile, give or take, and roughly four Whole Foods Markets if we stretch the radius. Big-box stores and e-tailers are intense competition that motivate us to adapt and sharpen our retailing skills. We also see more competition thanks to the mainstreaming of natural products. How do you maintain your competitive edge? JB: We regularly evaluate and curate new products for the next best-in-class. We incubate brands that radiate transparency, quality, integrity and sincerity. These products sit alongside their competitors for the discerning shopper’s intuitive choice. When a product does well here, it’s a draw. Because of our unique position as an incubator for startups, we recognized the value of LifeThyme as an anchor for their growth. We aim to protect interest in the brands we build, so we created an investment capital fund many years ago that functions to help smaller brands while we secure a stake in their growth. Also, we joined the Independent Natural Food Retailers Association back in 2011. INFRA is a great strategic partner and provides a host of valuable resources that enable us to improve and offer better pricing. How important is marketing to standing out? JB: Marketing and audience identification are so critical to keeping our head above water when our customer base is so easily lured by the omnipotent big-box retail competitors. Today we carry a budget for planning, execution, social media presence and advertising. We share expectations with our vendors to actively support their brands. What are the biggest challenges you face as an independent in Manhattan? JB: There are many, but No. 1 is the cost of doing business. NYC is more in alignment with national retail chains than ever before—small businesses like LifeThyme work hard to make it look easy. Also, innovation. We’re an older business competing against new corporate retail models with modern blueprints and larger budgets. Do you do a lot of grocery delivery? JB: Yes, always. This is New York City, so we’re very much a pedestrian-centric business. But many folks shop and have their bags delivered—that is normal for us. And on bad-weather days, our delivery business spikes. We co-brand with online shopping and delivery startup Mercato.com. But we are challenged by the migration to a click-and-shop platform because our inventory and product selection is not hard-coded. Being in New York City, LifeThyme and its customers are on the forefront of new food trends. So what’s next? JB: We continually roll out new products that capture the early stages of a trending movement, such as what we did with paleo, not knowing the term until the trend was formalized. Right now we are incubating a few locally produced, hot new styles of seeded cracker, a high-protein, no-sugar snack, as well as grain-free cookie brittle and international foods. Shoppers here are xenophiles—they love specialty foods from abroad and adaptations of them. At the same time, they are fairly parochial in their shopping radius. So that opens the doors for us to introduce them to international foods we love that you can only find in the outer boroughs. We also anticipate a growing movement toward prepared grab-and-go foods given the convenience factor that rules in this area of NYC. Do you have plans to open more locations? JB: We are enduring a four-year-long (and counting!) major renovation of our infrastructure, exterior and interior that includes the implementation of new state-of-the-art self-checkout units. We’re continuing the branding and rebranding process to maintain a competitive edge with our super-heavyweight competition. We have no plans to open another location as of now. Rather, we are focused on our many opportunities to participate in “road shows,” where we bring our food production to offsite events. Could a downtown location be a good fit for your natural store?